Wouldnâ€™t it be fantastic if you could simply wave a magic wand to get kids to do what you wanted? Too many parents, and teachers for that matter, struggle to get their requests heard, understood and taken seriously â€“ kids just donâ€™t seem to be able to do as theyâ€™re told nowadays. 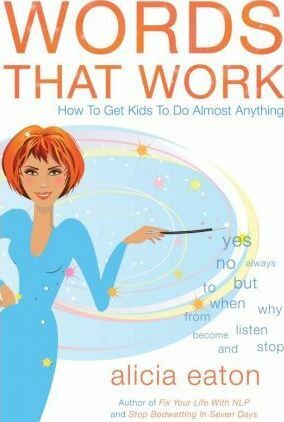 In Words that Work: How to Get Kids to Do Almost Anything, author Alicia Eaton, a leading Harley Street Hypnotherapist & Advanced NLP Practitioner, explains how much easier it is to get children to co-operate, simply by changing the vocabulary and structure of your sentences. She shows how powerful words are if you know about the NLP â€˜language of persuasion and influenceâ€™. And also shares the secret to slipping â€˜hypnotic influenceâ€™ into day-to-day conversations. Originally a Montessori teacher and a mother to three, now grown-up children, Aliciaâ€™s combined all her skills, knowledge and expert training to create this unique parenting system that really works. So whether the issue is mealtime arguments over fussy eating or junk food cravings; an anxiety or phobia about dogs, spiders, going to school or exams; a lack of confidence; bad habits such as nail-biting, thumbsucking or bedwetting, youâ€™ll quickly learn what to say and what not to say. Youâ€™ll be able to put an end to the nagging and yelling that gets you nowhere and wears you out; reward systems and star charts that quickly lose their appeal; bribery and punishments that achieve nothing and make everyone feel bad. Parents who appear to have well-behaved, happy, high achieving kids are not just plain â€˜luckyâ€™ - quite simply, theyâ€™re handling things differently and with a bit of inside knowledge, you can too.